The Lego Ninjago Movie Videogame is short and a little rough, but a dynamic new combat system and a couple surprising tweaks to ageing mechanics make it one of the most exciting new Lego games in years. The eight story chapters in the game focus on rehashing the plot of The Lego Ninjago Movie. Green ninja Lloyd and his ninja companions are the defenders of Ninjago City, a bright and garish Tokyo-esque metropolis located on an ancient island. The city is terrorised by the evil Lord Garmadon—Lloyd’s dad—and his army of aquatic-themed mechs and thugs. Eager to embrace his destiny and defeat his father once and for all, Lloyd screws up and puts all of Ninjago Island at risk. Only a spiritual journey to the heart of the island can help Lloyd come to terms with his parentage, gain his Spinjitsu power and save the day. I didn’t expect much from The Lego Ninjago Movie Videogame. Announced just three months ago with a date coinciding with the release of the movie, all signs pointed to a quick and dirty cash-in. It wouldn’t be bad—long-time Lego game studio TT Games never phones anything in—but it wouldn’t be anything special, either. My preconceptions were shattered within the first few minutes of the game’s opening combat tutorial. With moves like the Rushing Boar charge attack, the ground-pounding Swooping Hawk and the Floating Butterfly, which is pretty much Sonic the Hedgehog’s homing attack, this isn’t the simplistic minifigure combat I am used to. This is so much better. It’s less floaty flailing and more finesse. Spamming a single attack won’t do. 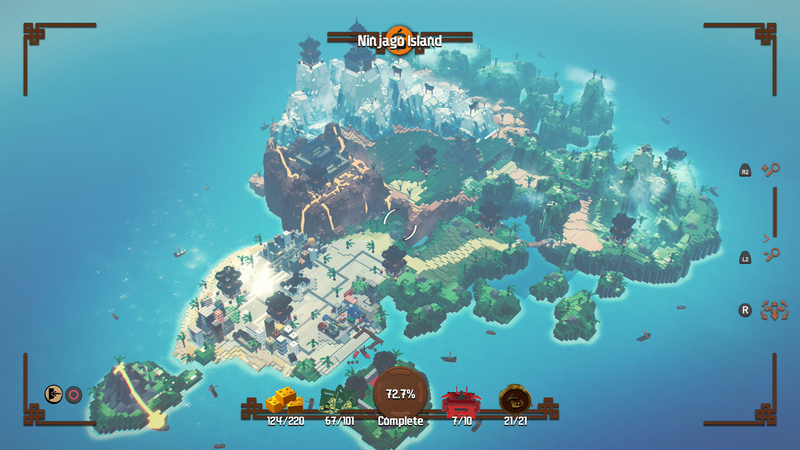 Enemies quickly get wise and begin blocking, forcing players to mix things up. Accompanying the bold new combat is a combo system that rewards players with more studs (Lego’s traditional in-game currency) the longer they keep the hits coming. It’s a fighting system that encourages players to have fun with it. And it is a whole lot of fun. Up until now, combat in TT Games’ Lego titles has been little more than an obstacle, something to keep players from getting from point A to point B—beat up five orcs or Stormtroopers or pirates or whatever to advance to the next area. In The Lego Ninjago Movie Videogame, I actively seek out combat, both for the thrill and for the studs. Plus the sweet ninja movement system makes hunting for anything, even combat, an enjoyable pursuit. Collecting studs has always been a major part of TT Games’ Lego series. As players progress through a level they collect silver, gold, blue and purple studs by defeating enemies, smashing Lego objects or simply picking them up off of the ground. Each level has a stud goal to achieve, and reaching that goal is one of the series’ primary motivations. Collecting studs is also incredibly distracting. It’s hard to focus on what Luke Skywalker, Captain Jack Sparrow or Frodo Baggins is doing story-wise with that stud meter hanging over one’s head. 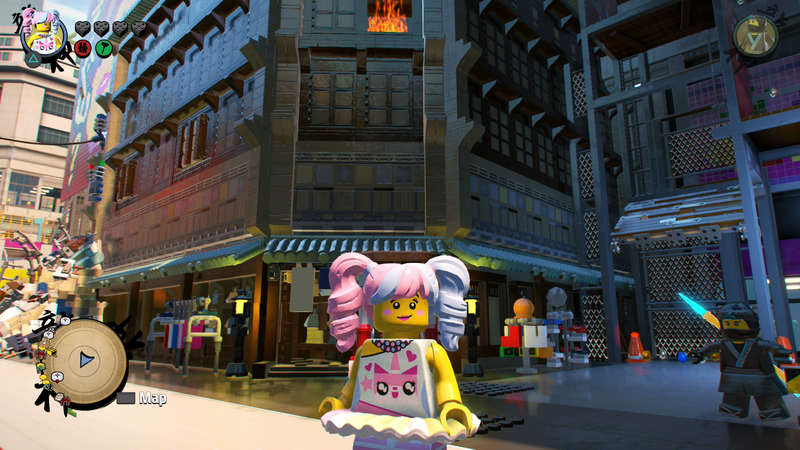 Some players can breeze through a Lego game level without worrying about studs, going back to collect them later in free play. I am not one of those players, so I really appreciate what The Lego Ninjago Movie Videogame has done with stud collecting. For the first time since 2005's Lego: Star Wars, there is no per-level stud collecting requirement. It’s gone. Kaput. Good riddance. Instead of a per-level stud meter, there’s a multi-levelled meter that follows the player throughout the game. Each time the player fills the meter completely, they gain a stud-collecting rank, earning a gold brick and some parts for the game’s custom character creator. The tiered stud meter, my new best friend. What a massive difference this simple change makes. Instead of being penalised for missing a goal, players are rewarded for achieving milestones. Finally I can enjoy the story in a Lego game without having those shiny little bastards constantly gnawing at the back of my mind. Even better, studs are no longer required to unlock new characters. In previous Lego games players would discover or be rewarded with new characters upon completing goals. The characters would be added to their roster, but players had to pay studs in order to fully unlock them for play. It was an extra added step that made absolutely no sense. In The Lego Ninjago Movie Videogame, new characters discovered or rewarded are immediately playable. Excellent. These big changes to the Lego game formula layer nicely on top of gameplay elements introduced in more recent games. From Lego Star Wars: The Force Awakens we get multi-builds, piles of bouncing Lego bricks that can be directed to different locations, offering multiple solutions to some of the game’s puzzles. 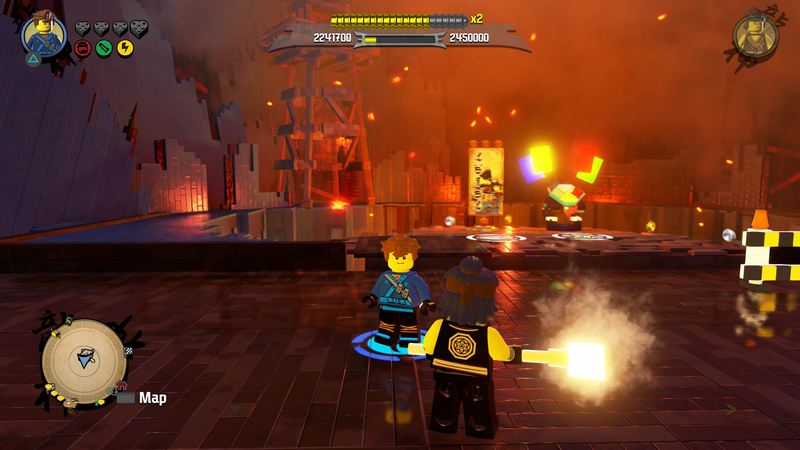 From Lego Dimensions we get multiplayer battle arenas, where up to four players can compete in a series of competitive games involving collecting artifacts or capturing flags. The game also features a series of dojos, special arenas where players battle waves of enemies in order to score studs and special characters. It’s filler, but it’s good filler. It also gives the game a chance to explore much more of the Ninjago line’s seven year history than is covered in the under-two-hour theatrical release it’s based on. Though lighthearted and rife with humour, the story is the weakest part of The Lego Ninjago Movie Videogame. As with many movie-centric Lego games, large chunks of plot are left out and characters disappear and then reappear with little explanation. The whole affair lasted all of three hours, and it did not end well at all. “Oh, I guess that’s it,” were my exact words. The real fun comes after the story’s over. 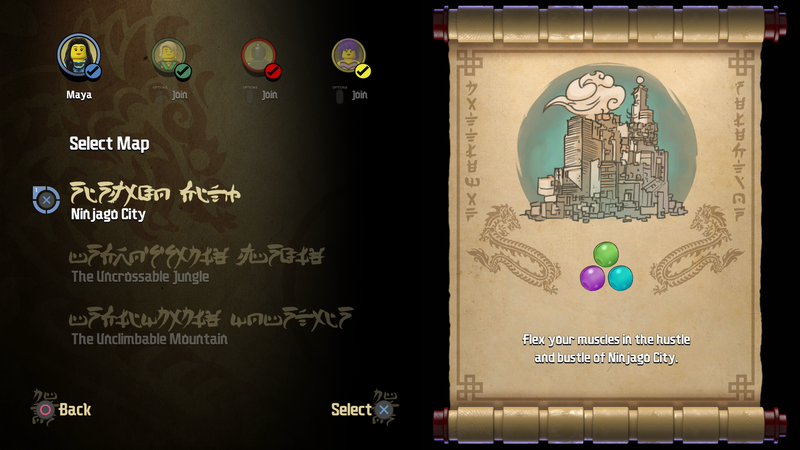 Rather than being self-contained levels tied to a central hub, each of The Lego Ninjago Movie Videogame’s levels takes place in its own open free-roaming map. Once a chapter is complete the players are free to roam these massive areas, using all of their characters’ special skills and Spinjitsu powers to scour every inch for new friends and secrets. It’s a grand treasure hunt that spans the entire island, from the Ninjago City Docks to the City of Fired Generals, a settlement built by the discarded generals fired (into a volcano) by Lord Garmadon. Each contains a battle arena to compete in, a dojo to challenge, hidden characters and gold bricks and multiple areas that can only be unlocked once a requisite number of gold bricks are discovered. The only caveat here is that the exploration might not last long. I’ve been playing off and on since Friday afternoon, and I’ve already got more than 70 per cent completion. Were I not writing this review, I might be done by now. It doesn’t help that the game includes an easily-acquired treasure radar. I mean, it does help, but I sure am speeding through now. Reaching 100 per cent completion on this one will be bittersweet, as I’ve really enjoyed my time with The Lego Ninjago Movie Videogame, certainly much more than I’ve enjoyed typing out the name. It’s an unexpected treat of a game, one that bodes well for the future of the Lego video game series. A rapid-release movie tie-in is a really strange place for innovation, yet here it is. Maybe if I pace myself can make that final 28 per cent last until Lego Marvel Super Heroes 2 arrives on 14 November. It helps that the game features my new favourite minifig.